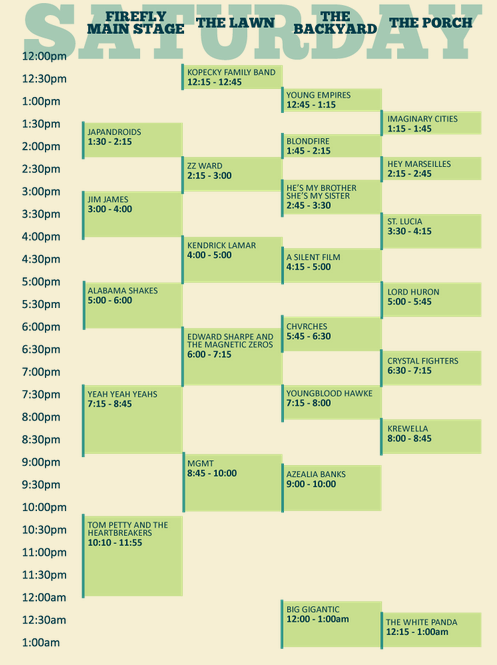 Firefly released the schedule of shows for its 2013 music festival. The biggest difference between the 2012 lineup schedule and this year's schedule is that the headlining shows will be going on later at night and so ending later - in 2012 the headliners ending at 11ish, not 12 like it will be in 2013. And as a nice bonus - Firefly scheduled shows for after the headliners, electronic shows from 12-1 am. The show I may be most excited about all weekend is White Panda at midnight on Saturday night. FRIDAY. I was surprised to see the Red Hot Chili Peppers headlining Friday night. I thought they would be the headlining headliner on Saturday night, but they're up for Friday. Hopefully you are getting down to Dover early Friday morning (I am) and can catch shows from the first minute. I will be there to see Wild Belle at 2:15, Atlas Genius at 4, Dr. Dog at 5 and Ellie Goulding at 6. Tough choice between the Avett Bros and Public Enemy at 7:15. Another big decision is whether I stay for the entire Calvin Harris show that ends at 10:25 or head to the Firefly Main Stage early to get a good spot for the RHCP. Count me in for Dan Deacon at 12:15 - the Backyard is my favorite stage. SATURDAY. Of course I want to be watching shows all day on Saturday, but let's be realistic here - depending on how hot it is, how late I'm up Friday, how hydrated (or dehydrated) I am, it will be tough to make it all day. Last year we walked over first thing Saturday, caught a few early shows from the front rows (literally) and then regrouped at our camp site to gear up for Saturday afternoon and night. I figure to do the same this year. My goal is to make it over to the grounds for Kendrick Lamar at 4 (way better than Drake). Then it's a cluster - Alabama Shakes or Lord Huron? 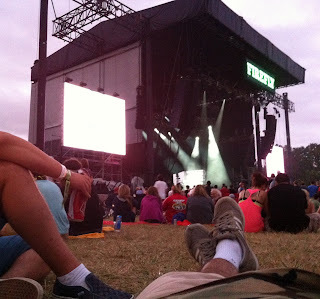 Run back and forth between stages (and lose good spots) for Ed Sharpe, Yeah Yeah Yeahs and MGMT? After a couple of Dogfish beers that becomes an even bigger challenge. The best thing is, no matter what you do you can't go wrong. But I will be ready for White Panda late night. SUNDAY. It can be a mixed bag on Sunday as some people are heading out early if they work Monday (sorry) or they're don't and are going just as hard on Sunday as they did on Saturday and Friday (awesome). By Sunday you have a good handle on all the stages, what you really want to see and what you don't, and where your priorities are. Heck, you may be ready to skip a show to hang out in the hammock area (try it). At 6:30 Passion Pit will be finally making its debut at Firefly after tweaking out last year...of course you'll have to miss the Walkmen but those are the breaks. I prefer Vampire Weekend to Foster the People so I'm going to stake out their show and not rush getting over to the main stage for the final show of the weekend. By then you'll probably be tired, dirty, hungover and sunburned, but it will all be worth it.